During our visit to the Northern Rhône, every set of hands was fervently at work with the harvest. As a result, we weren’t able to have a comprehensive tour for each of the facilities we visited, but we sat down in the tasting rooms of Georges Vernay and Domaine Faury and spent time with them via email afterward delving into their wines and vision. Both had a strong artisanal imprint. Georges Vernay is viewed by many as the “savior of Condrieu” because he was very influential in preserving these elegant and complex wines from extinction. His daughter Christine took over the reigns of the Domaine in 1997. I exchanged a few emails with with Paul Amsellem, one of the owners of Domaine Georges Verney and Christine Vernay’s husband, to get a brief understanding of the history of this AOC. The appellation (AOC) of Condrieu dates back to 1940. After World War II, much of the vineyards of Condrieu had been replaced by peach and apricot orchards. In the 1950’s, the vineyards had whittled down to fewer than 20 acres. Paul conveyed, “Georges Vernay technically started his domaine in 1950” and at the time, owned 15 of the 20 acres. He lobbied with others to preserve this treasured wine and as a result, Condrieu now boasts of 270 acres. In total, Vernay owns about 45 acres in the Northern Rhône. Christine focuses on producing “straight, elegant and areal wines.” They were absolutely thrilled to have us as guests. Georges has a very strong relationship with Paul Bocuse and the Vernay wines grace the wine lists at Bocuse’s restaurants in nearby Lyon. Vernay’s wines are also featured on the wine lists of many high end restaurants such as The Fat Duck, French Laundry and Le Bec Fin. Prices indicated below are the cost at the vineyard and are not inclusive of import fees, taxes, shipping etc. All wines were grown and made on premises (Domaine). What did we buy, why and what would I pair it with? My friend Susannah and I were talking about eggs with truffles last night as her 3 year old son Phillip, who was dressed in a sports jacket with shoes that light up, prepared pretend meals for us and his imaginary mouse. Perhaps it was Phillip’s prowess with a pretend stove and pan, but I can’t get the eggs out out of my head and think that would be so yummy with these two Condrieus. I also think something like a simple chicken dish, lobster or asparagus would do the job nicely. 2007 Chaillées de l’Enfer Condrieu – I enjoyed the delicateness and little bit of nut I got on the finish. I also fancied the translation of its name – Terraces from Hell. 2007 Côteau de Vernon Condrieu – This is their original vineyard and part of the history of Condrieu. We had to walk away with some of this. It also came in half bottles, which I thought was nice to mix it up as we aren’t always in the mood for a whole bottle. 2007 Blonde du Seigneur Côte-Rôtie– It was the best of the reds we tasted there. I am feeling something gamey or stew-like for this one – a little bit of winter comfort food plus this bottle would be heavenly. They were in the thick of the harvest when we arrived, but Lionel Faury, who works side-by-side with his father Philippe, sat down with us for our tasting. Faury currently has about 17 hectares (41 acres), 8.5 in St. Joseph, 2 in Côte-Rôtie, 3 in Condrieu and 3.5 VDP (Vin de Pays or “Country Wine”). VDP sidebar… VDP respresents about 20% of France’s wine production. (source: WSET 2005 – Exploring the World of Wines and Spirits). 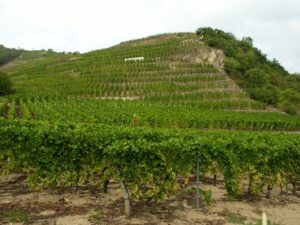 Laws are specific in AOC regions, dictating among other things, the exact percentage of certain varietals permitted by terroir in the vinification process. 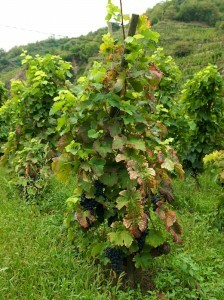 As an example, Côte Rôtie is only allowed up to 20% Viognier and 100% of the residual portion must be Syrah. VDP has fewer restrictions than higher appellations and often encourages creative wine makers, which we as wine drinkers, get to benefit from as VDP Comtes Rhodaniens (VDP from the Northern Rhône) can be quite yummy and not expensive. In the past, Domaine Faury had been recognized for a classic and traditional interpretation of Northern Rhône wines, but Lionel added, “I think I am a young wine maker who makes his best for the wine and I think I would like to find a good balance between the ‘tradition’ and the ‘evolution’ way of making wine.” Faury wines are featured on the wine lists of some select, high profile restaurants and are very grateful for the exposure they’ve received as a result. However, Phillipe was indifferent to any pomp or stature associated with listing these restaurants. His focus was on the the viticulture and the quality of the wine itself, being a wine maker first and foremost, which was especially charming. The wines were so reasonably priced, especially for the quality. As we left their home and winery armed with our purchases, the entire Faury family waved goodbye to us from their patio. What did we buy and why and what would I pair it with? 2007 Cuvée La Berne Condrieu – We loved the delicacy and minerality on this one. You cannot beat the price and quality. I’m just loving simply prepared white meat dishes which won’t complete with its perfume, a delicate seafood or simple dumplings with this. You can’t go wrong. 2007 Cuvée La Gloriette Saint-Joseph – I am going to sound redundant, but it was an amazing wine for this price point. With that bit of fig on the palate, I’d pair it with duck, lamb or pork.